A mammoth crowd packed into east London’s Lee Valley Hockey and Tennis Centre to witness some fabulous action in the first Saturday of the Vitality Hockey Women’s World Cup London 2018. Four stellar matches ensured that this eagerly anticipated competition got off to the best possible start. The opening session of the Vitality Hockey Women’s World Cup London 2018 was a witnessed by a crowd of 10,500 being thoroughly entertained by two cracking matches, with Germany producing a classy performance to overpower Pool C rivals South Africa before the partisan crowd watched England claim a draw against India in Pool B.
Germany (FIH Hero World Ranking: 6) made a superb start to their World Cup campaign with a deserved victory over a South Africa (WR:14) team that did not make it easy for the team coached by Xavier Reckinger in the competition opener. Die Danas were the better side in the opening period, controlling possession and creating chances to force some good early saves from South Africa goalkeeper Phumelela Mbande before the opening goal arrived a minute before the quarter-time break. Viktoria Huse scored the first goal of what promises to be an wonderful World Cup competition in London, deceiving Mbande with a smart turn before passing into an open goal. Germany extended their advantage two minutes into the third quarter when the excellent Charlotte Stapenhorst fired home from close range before South Africa, who grew in confidence as the game progressed, hit back thanks to a deflected penalty corner slap-shot from Lisa-Marie Deetlefs. However, few would argue that Germany were worthy winners, with Huse claiming her second of the match from the penalty spot in the 54th minute to seal a 3-1 victory for Germany. With a full house watching on, the atmosphere during the contest between home favourites England (WR:2) and Asian continental champions India (WR:10) was intense throughout. Danny Kerry, England Head Coach. England thrilled the home fans by winning but failing to convert a penalty corner in the opening seconds, but India were far from overawed by the occasion. The Eves were the first team to have a shot in anger, with England’s Maddie Hinch comfortably kicking clear a strike from Navjot Kaur. England had a penalty stroke overturned by the video umpire in a second quarter where they were unusually wasteful in front of goal, something that they were left to rue in the 25th minute when Neha Goyal deflected home from close range to give India a 1-0 lead at half time. The hosts spent most of the third quarter camped in Indian territory, with Alex Danson and Lily Owsley both growing in stature as the game progressed thanks to their trademark bursts forward. Owsley was particularly influential in the final quarter, and when Hinch was replaced with an attacking player with ten minutes remaining, the breakthrough that England had been searching for arrived. Owsley was the scorer of the equaliser, forcing home from close range six minutes from time after India failed to effectively clear their lines from a penalty corner, ensuring that the match finished with the honours even at 1-1. The second session at the Lee Valley Hockey and Tennis Centre contained unquestionably the best match of the day, as USA (WR:7) and Ireland (WR:16) were involved in a hugely entertaining, fiercely contested game that upset the FIH Hero World Rankings. Ireland claimed a stunning 3-1 victory over the Americans, a result which saw the second lowest ranked team in the competition end Day 1 sitting top of the Pool B table. The Green Army – playing their first World Cup match for 16 years – were outstanding in the opening quarter, taking a 1-0 lead after just five minutes when Deirdre Duke produced a calm and collected finish after finding herself one-on-one with USA shot-stopper Jackie Briggs. That advantage was doubled thanks to a fierce penalty corner strike from Shirley McCay, but an ingenious penalty corner routine from the Americans, finished off by Margaux Paolino, made the score 2-1 at the end of the first quarter. USA were very much in the ascendency in the second quarter, but they could not find a way past outstanding Ireland goalkeeper Ayeisha McFerran, who was named Vitality Player of the Match. While McFerran was in sparkling form, her goal also lead a charmed life when another wonderful USA penalty corner routine hit the crossbar ahead of a half time. The killer blow arrived six minutes after half time and again it was Duke who was the scorer, finishing off a rapid counter-attack with a close range strike that rattled the pads of USA goalkeeper Briggs before bouncing over the line to give Ireland a shock victory over a team that finished fourth at the 2014 World Cup in The Hague. “We just decided to go out and enjoy it”, said delighted Ireland forward Anna O’Flanagan after the match. The final match of Day 1 saw two teams who are very familiar with each other’s style of play go head-to-head. Australia (WR: 5) and Japan (WR: 12) have enjoyed a number of test matches in recent months, and the scene was set for a tightly contested game to open Pool D proceedings. The first quarter passed without a goal being scored but the second quarter was only one minute old when Rosie Malone deflected the ball from a penalty corner into the top of the goal past Japan’s ‘keeper Megumi Kageyama. Kageyama was called into action seconds later when she raced out to thwart Brooke Peris who was clear on goal. Australia’s second goal also came in the second quarter as Emily Hurtz got on the end of a sequence of smart passes by her midfield to deflect the ball into the goal. 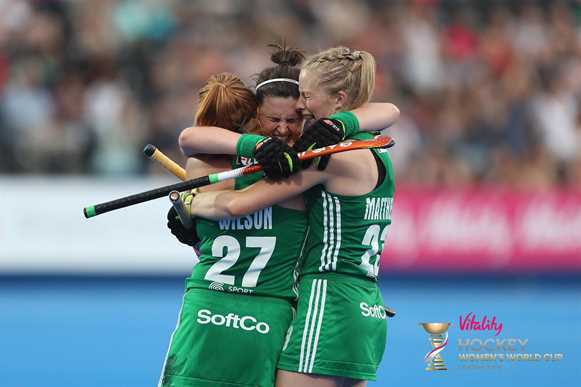 Things continued in much the same vein as Vitality Player of the Match Jodie Kenny opened her World Cup account with a trademark precision penalty corner in the top right corner to take the game to 3-0. Japan came back through Motomi Kawamura, who took the ball wide of the Australia goal circle and powered past Rachael Lynch in the Hockeyroos goal. To this point the game had been almost one-way traffic but Kawamura’s strike gave the Cherry Blossoms the confidence to begin to push for another goal. Lynch showed her class with six minutes left on the clock as she forced Kawamura wide when she appeared to have a clear route on goal. Japan enjoyed a late surge as Akiko Kato made it 3-2 after a goalmouth scramble left the tenacious midfielder with a clear shot. Speaking after the game, Kenny said: “It was nice to get a win for our first world cup game, starting the campaign with a bang but there is lots to learn from that game. We came out firing but then we gave them too many opportunities in that second half and they managed to get two back. For all the news from the Vitality Hockey Women’s World Cup click here.